Sounds ridiculous doesn’t it? It’s absurd logic that the majority of people would disagree with, however it’s the same logic plagues arenas and rinks throughout this country. When enrolling in organized hockey, many parents assume the kids will figure it out for themselves on the ice. They’ll eventually learn how to skate, shoot, pass, etc and it will all come together nicely at some point in time to make an elite scoring machine. Wrong. 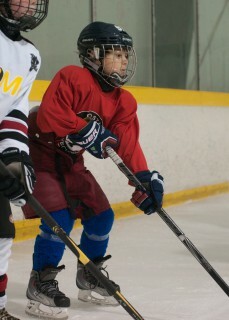 Learning proper skating technique isn’t something that players can self-teach during a game or even a practice. Hockey requires your brain and your body to do multiple actions simultaneously. Skating, stick handling, passing, shooting, vision, etc. This isn’t exactly an easy feat for most of us, let alone someone just starting off. Your child’s hockey coach is there to map out plays on the ice and execute hockey-focused drills. Many don’t have the tools or the time to pinpoint and correct improper skating technique. Just a reminder, most coaches are volunteers. I’ve had quite a lot of dental work, I would be more than happy to volunteer to do your dental work. You wouldn’t build a house without a proper foundation, would you? Well, skating is the foundation to the game of hockey. Instilling proper muscle memory through repetition of proper skating technique is vital for success on the ice. Once the foundation is firmly in place, you can then build upon it over time, crafting an elite skater and, eventually, hockey player.